In keeping with its vision of expanding its global footprint to as many as 50 countries by 2020, Hero MotoCorp Ltd (HMCL) – the world’s largest two-wheeler manufacturer – recently launched its operations in Bangladesh through a Joint Venture (JV) with the reputed Nitol Niloy Group. The company will set-up its first manufacturing plant outside of India will come up. It will be operational by the second quarter of Financial Year 2015-16, the plant will have an annual capacity of 150,000 units. Currently, the Hero range of two-wheelers is being made available in Bangladesh through the initial 50 retail outlets. 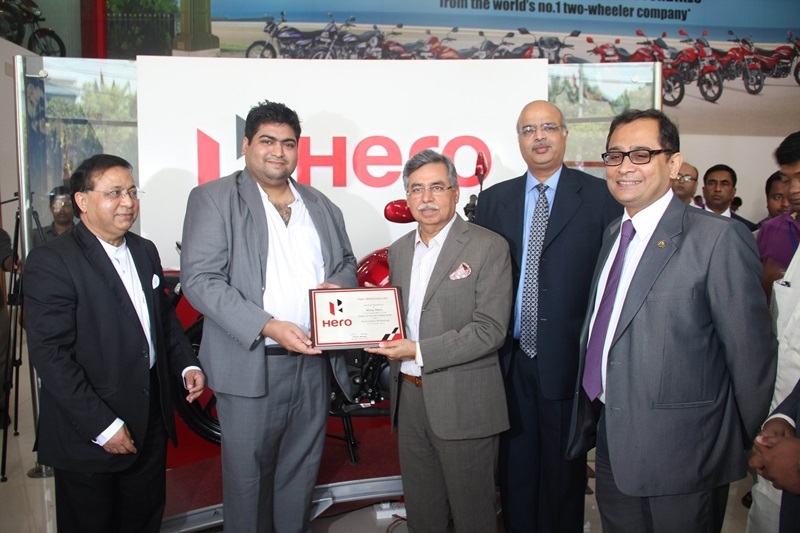 Mr. Munjal recently inaugurated the first of the flagship Hero showrooms in Dhaka. More outlets are also being rapidly added in markets across the country. The range of Hero two-wheelers being made available in the country include successful models like the entry-level segment 100cc bikes- HF Dawn & HF Deluxe, Splendor+, Splendor Pro, Splendor iSmart, Passion Pro, the deluxe segment125cc Super Splendor and Glamour and the premium segment 150cc Xtreme and Hunk, and the 100-cc scooter Pleasure. Hero has launched an unprecedented 5-year warranty on all these models in Bangladesh – a statement of confidence in the technological superiority of its products. The Splendor iSmart is the most recently launched offering of Hero MotoCorp that comes with the revolutionary i3S (Idle Stop and Start System) technology. i3S technology automatically shuts the engine when idling, and turns it on when needed, with a simple press of the clutch, giving more mileage in congested cities. Hero MotoCorp will soon launch brand-building initiatives in this market with the Bengali version of the iconic Hero anthem “Hum Main Hai Hero” (There’s a Hero in Each of Us) which will be aired across television platforms in Bangladesh. There will also be brand-specific communications to establish Hero products in the country. Hero MotoCorp has fast augmented its global presence. As of today, Hero two-wheelers already sell in as many as 18 countries including Peru and Ecuador in South America; Guatemala, Honduras, El Salvador in Central America; Kenya, Mozambique, Tanzania and Uganda in East Africa; Burkina Faso, Ivory Coast, Congo and Angola in West Africa and most recently Turkey and Egypt. The company has also established its international assembly units in Kenya, Tanzania and Uganda in East Africa through its distributors.